Introducing the world�s only chrome portioning spout. 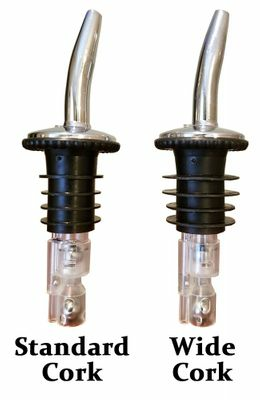 These Precision Pour spouts help bartenders portion every shot to the amount management wants customers to receive, not the inflated size bartenders tend to pour to solicit bigger tips. Measured pourers provide consistency to the taste of mixed drinks and drastically reduce liquor costs by curtailing overpouring. You can now have that chrome free-pour spout look but your bartenders will actually be dispensing perfectly poured shots into every drink. Did you know that if your bartenders overpour only 1/4 ounce per drink (the thickness of the line on a shot-glass) they are wasting over 6 ounces per liter bottle? If you charge an average of $5 per ounce, then your bartender�s are throwing away over $30 per bottle! And you know what? 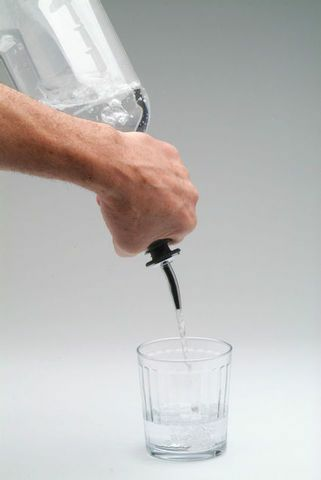 Most bartenders overpour between 1/2 � 3/4 ounce per drink. That means your operation is losing potential profits of over $60 per bottle of liquor. Do the math. How many bottles of liquor do you empty every day? How many every week? How many every month? Multiply those numbers by $60 and you�ll get an idea of how much money you are actually losing without accurate portion control. Choose from Precision Pours with a Standard Cork, that will fit most 750 ml and Liter bottles OR with a Wide Cork that will fit 750 ml and Liter bottles with oversized bottle necks. The Wide Cork also fits well into half-gallon and 1.75 liter bottles. Add $1 for wide cork spouts. Available in 3 portion sizes: 1 ounce, 1-1/4 ounce and 1-1/2 ounce.